Rosa Banksiae lutea is a vigorous climber with long, smooth, thornless stems and small leaves composed of up to 7 leaflets, and numerous clusters of rosette-shaped double yellow flowers, to 2cm across, in spring and early summer. To 10m or more. [Paul (1848, 1863, 1888, 1903), Rivers (1854, 1857, 1863), Willmot, BR f.1105/1827]. ‘This beautiful rose was first noticed by Brown, in the Hortus Kewensis, and named after the lady of Sir Joseph Banks.’ [Gore]. ‘This is a very pretty climbinbg rose: it was introduced in 1824 by the Horticultural Society, and being very freely increased by cuttings, has already become most extensively diffused throughout the country.’ [LBC no.1960/1833]. The double yellow form was imported by the Horticultural Society in 1824 from the Calcutta Botanical Garden where it was cultivated under the name of ‘Wong-moue-heong’. Les Plus Belles Roses au début du XXe Siécle gives its introducer, presumably into France, as Damper in 1823. [Amat]. In the 1845 catalogue Rosa Banksia lutea is described as the yellow Banksia. In subsequent editions only Rosa Banksia lutea flore pleno is listed. As the single yellow Rosa banksiae lutescens was not introduced until 1870 this rose is clearly Rosa Banksiae lutea, the double Banksian rose. Plants of ‘Rosa Banksia Lutea’ were presented to the Sydney Botanic Garden on October 24th 1846 [RBGS AB]. 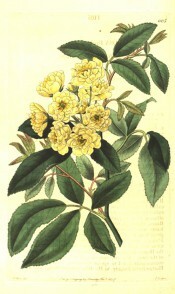 Listed in the 1850 and 1857 catalogues Rosa Banksia lutea fl. pl. [T.865/1850]. ‘All the evergreen roses save R. microphylla have flowered well, R. Banksiae lutea I like best, it is quite beautiful. Lucida duplex next. It is also a very beautiful variety, the flowers very large.’ Macarthur to Bidwill, 25th November, 1845. [MP A2933-2, p.98]. It is still growing at Camden Park. A plant of Rosa Banksia lutea flore pleno was presented to the Sydney Botanic Garden by William Macarthur on November 1st 1847 [RBGS AB]. Rosa Banksia lutea fl. pl.